A stylish modern 1700mm P shaped curved shower bath featuring a screen with integrated chrome towel rail, bath has been manufactured using high gloss acrylic providing a smooth quality finish. This practical shower bath provides plenty of space for showering and bathing. 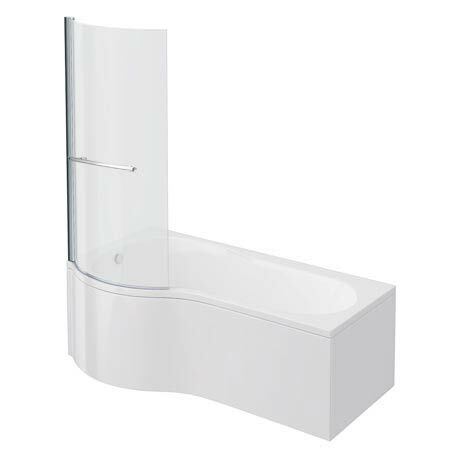 Supplied with a 6mm curved bath screen to create an enclosure and a curved bath front panel. Available in Left or Right hand options. There will be an element of compression in the thickness due to the bath forming process but the advised overall thickness for the bath tub would be around 4mm. Very good quality and the bath is very rigid. A lot of cheaper baths can by slightly flexible but this is excellent. Good quality fit well and looks nice.